Pocketbook's 13" ereaders are still months if not a year away from reaching store shelves, and today they gave us another reason to be patient and hopeful. Lesen.net caught up with the ereader maker at IFA Berlin this week, and posted this short hands on video for Pocketbook's CAD Reader Flex. 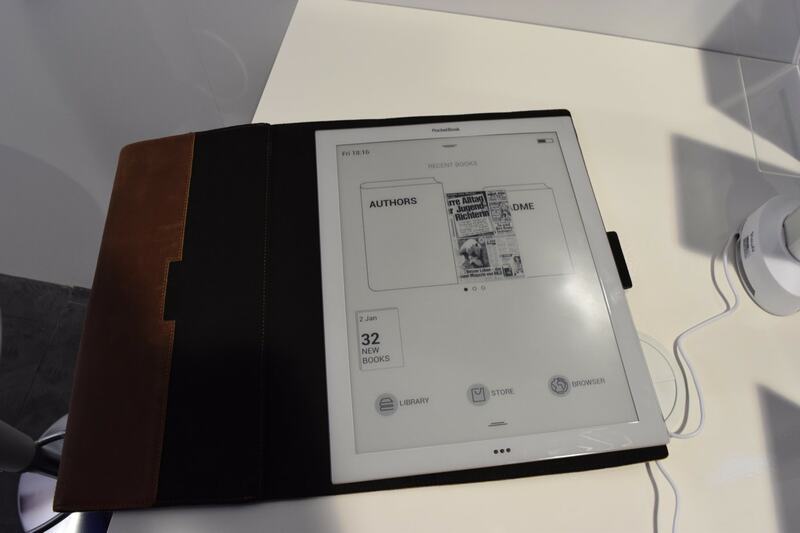 The CAD Reader Flex is the second of Pocketbook's two large-screen ereaders. It features a 13.3" Mobius E-ink display which, as you can see below, is quite flexible when compared to your average tablet. The video is narrated in German, but even with the sound off it is still an informative video. The demo unit is running Pocketbook's own ebook software, and that's a shame. Pocketbook's other 13" ereader, the CAD Reader, runs Android, and is thus better able to justify the high price tag. The CAD Reader Flex was announced in December 2014 but is not expected to ship until next year. It will cost somewhere between 500 euros and 1,000 euros. The CAD Reader, on the other hand, was announced close to two years ago. It is rumored to be shipping later this year, but Pocketbook won't commit to a date or even a month, so i would not bet on it. Looks like they will make the same mistake as Sony and give it hardware that can’t handle the screen properly. Really? I do not understand… The CAD Reader is expected to cost about 800 $ and the Flex has a more advanced technology, hasn’t it? Yes and no. The Flex will have a better screen and more interesting design but less capable software and weaker CPU. The Flex won’t be running Android, while the other model will. Android requires more hardware, so it’s a toss up whether the screen or electronics will cost more. Does that mean Flex will use Mobius and Android one Fina? That is what Pocketbook said when they released the specs, yes. But that was months ago, and things change. There’s really no way to tell what Pocketbook will decide to ship. We might only be getting one model, and who knows what it will run. That’s what we all want to know. It has not been released yet.